It’s been 10 years since Apple Inc. unleashed a surge of innovation that upended the mobile phone industry. 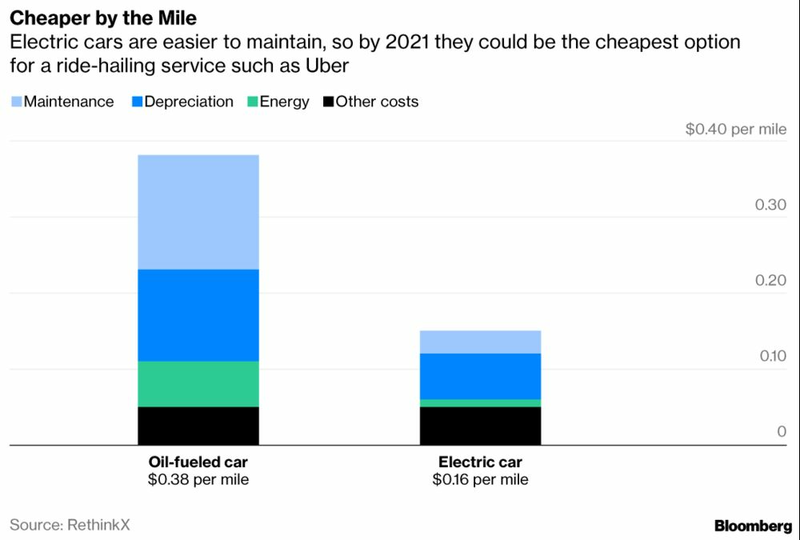 Electric cars, with a little help from ride-hailing and self-driving technology, could be about to pull the same trick on Big Oil. The rise of Tesla Inc. and its rivals could be turbo charged by complementary services from Uber Technologies Inc. and Alphabet Inc.’s Waymo unit, just as the iPhone rode the app economy and fast mobile internet to decimate mobile phone giants like Nokia Oyj. The culmination of these technologies — autonomous electric cars available on demand — could transform how people travel and confound predictions that battery-powered vehicles will have a limited impact on oil demand in the coming decades. 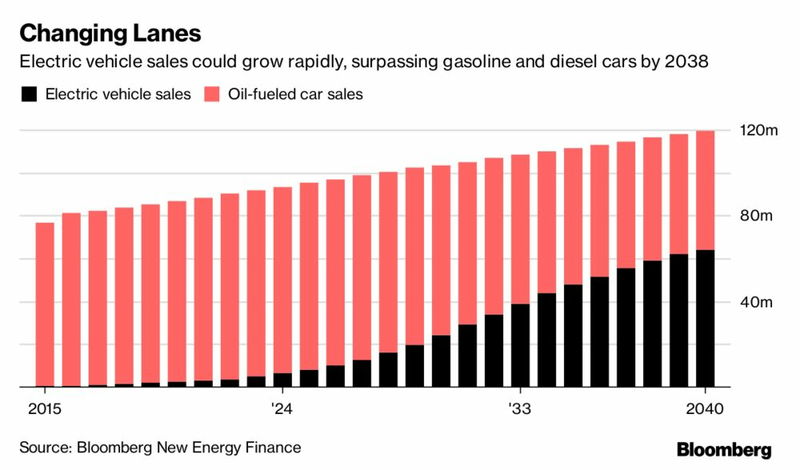 Most forecasters see the shift away from oil in transport as an incremental process guided by slow improvements in the cost and capacity of batteries and progressive tightening of emissions standards. But big economic shifts are rarely that straightforward, said Tim Harford, the economist behind a book and BBC radio serieson historic innovations that disrupted the economy. That’s what happened 10 years ago. The iPhone didn’t just offer people a new way to make phone calls; it created an entirely new economy for multibillion-dollar companies like Angry Birds maker Rovio Entertainment Oy or WhatsApp Inc. 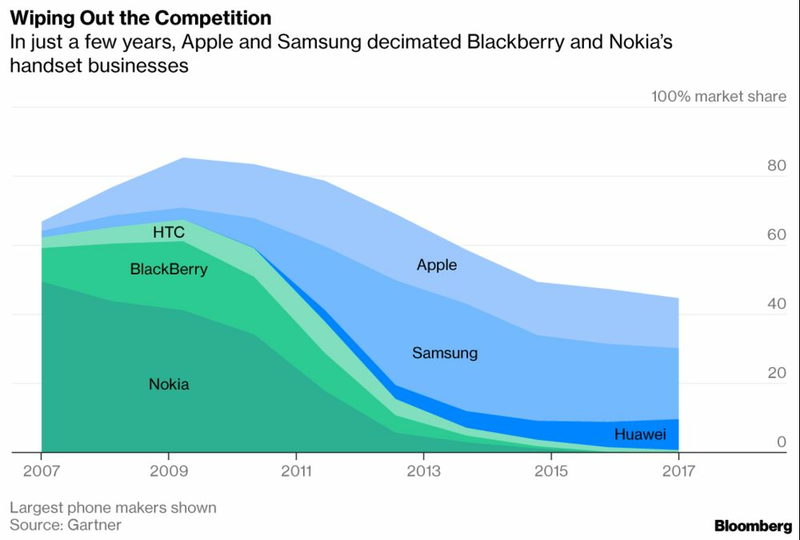 The fundamental nature of the mobile phone business changed and incumbents like Nokia and BlackBerry Ltd. were replaced by Apple and makers of Android handsets like Samsung Electronics Co. Ltd.
Today, as Elon Musk’s Tesla and established automakers like General Motors Co. are striving to make their electric cars desirable consumer products, companies like Uberand Lyft Inc. are turning transport into an on-demand service and Waymo is testing fully autonomous vehicles on the streets of California and Arizona. One key advantage of electric cars is the lack of mechanical complexity, which makes them more suitable for the heavy use allowed by driverless technology, Francesco Starace, chief executive officer of Enel SpA, Italy’s largest utility, said in an interview. “I don’t see driverless being pushed into internal combustion engine” vehicles, he said. 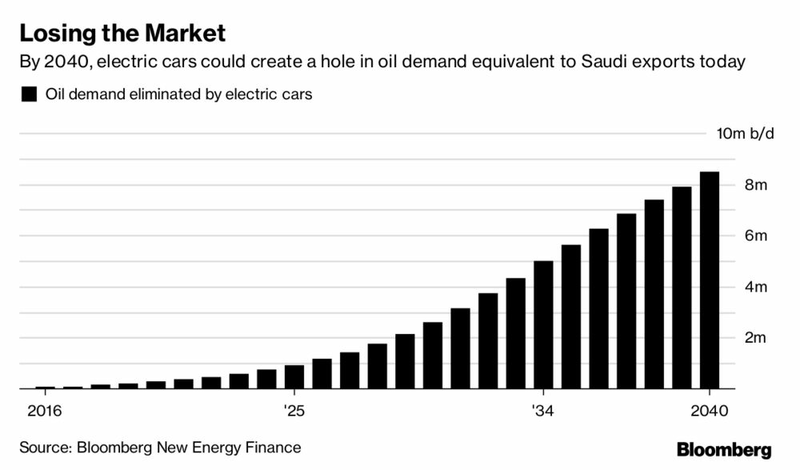 Even so, the shift to electric cars could displace about 8 million barrels a day of oil demand by 2040, more than the 7 million barrels a day Saudi Arabia exports today, the London-based researcher says. That could have a significant impact on oil prices—a drop of 1.7 million barrels a day in global consumption during the 2008-2009 financial crisis caused prices to slump from $146 a barrel to $36. That doesn’t mean oil giants like BP or Exxon Mobil Corp. are heading for an inevitable Nokia-style downfall. While transport fuels account for the majority of their sales, they also have huge businesses turning crude into chemicals used for everything from plastics to fertilizer. They also pump large volumes of natural gas and generate renewable energy, both of which could benefit from increased electricity demand. Even if electric vehicles do grow as rapidly as BNEF forecasts, the world currently consumes 95 million barrels a day and other sources of demand will keep growing, said Spencer Dale, BP’s chief economist. The London-based energy giant expects battery-powered cars to reduce oil demand by just 1 million barrels a day by 2035, while also acknowledging the potential for a much larger impact if the industry has an iPhone moment.